VOGONS • View topic - Formula 1 (95) z order bug? Formula 1 (95) z order bug? In the original Psygnosis Formula 1 game (Glide), the rear wings of cars are drawing inside the author of the car, on close up behind-the-car view. I can't remember if real 3Dfx hardware had this issue or not. nGlide renders it properly, but has its own share of z-fighting bugs, as does the Zeckensack wrapper. I haven't tried PCem yet. Any ideas? Or possible fixes? Re: Formula 1 (95) z order bug? 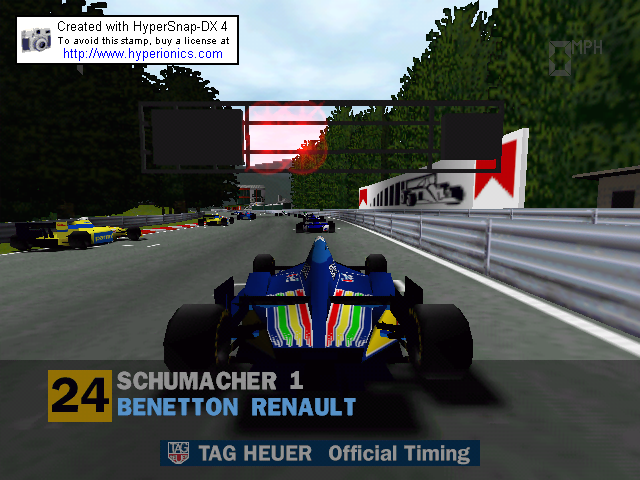 Just tried it on PCem, with the fully software emulated Voodoo2, and the same rear-wing clipping bugs occur (take the Jordan car for example, the rear-wing vanishes on close up behind-car camera). So I suspect that nGlide somehow has fixed a bug that should possibly happen, somehow! Here's a collection of shots I just took of the game with my voodoo 2 using hypersnap dx. 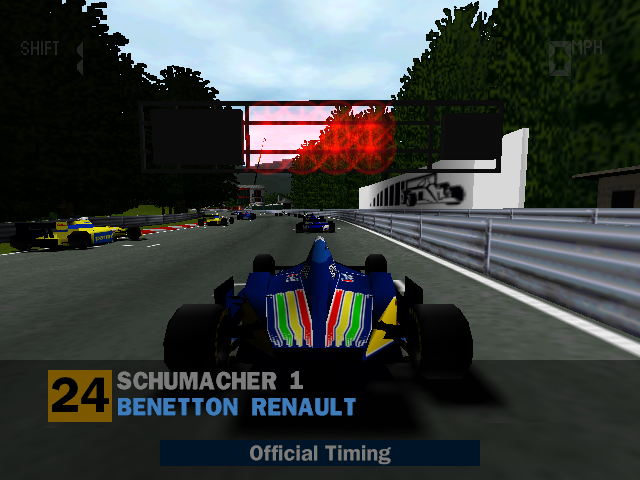 VirtuaIceMan wrote: Just tried it on PCem, with the fully software emulated Voodoo2, and the same rear-wing clipping bugs occur (take the Jordan car for example, the rear-wing vanishes on close up behind-car camera). Ok, so it's a feature, not a bug in dgVoodoo. A further question though, is about gamma. I remember Glide games turning up the gamma a bit, and on pcEM the default is 1.3 gamma setting. I can replicate this in nGlide's settings or using desktop settings and let dgVoodoo2 inherit them. In which case, dgVoodoo looks the best apart from the rear wing clipping/ordering bug. One more thought: dgVoodoo1 had a big issue where most of the car was cut off by clipping. It does appear, when you swap from further away behind-the-car camera angles to the closest one (to the car) that the rear wing might just be hitting some camera clipping and is being cut off. So PCem is most accurate, possibly (tgod please confirm on real hardware; start of race at Belgium, ninja draw depth), but dgVoodoo is nearly identical to it, apart from the rear wing. nGlide has the best rear wing, but has much heavier anti-aliasing (fade to black) on the edges of trees and the horizon. Thanks for that, nGlide does look slightly too dark on the edge of transparent tree textures, and certainly on the horizon, whilst the rear wing on PCem is the most accurate. Interesting that the red chevrons for Marlboro are missing in all mine, maybe the Platinum rerelease had them purged from the game! F1 '95 / '97 both got ps1 releases so you could compare them to that, probably better off emulating them anyway in HD/4K with shaders on one the various emulators supporting the GTE Accuracy Hack and XBR texture filtering. The PC versions will look better; with dgVoodoo2 or nGlide you can ramp them up the high definition, plus there's better things like perspective corrected textures, which the PS1 doesn't do. The PS1 version has better music though. VirtuaIceMan wrote: The PC versions will look better; with dgVoodoo2 or nGlide you can ramp them up the high definition, plus there's better things like perspective corrected textures, which the PS1 doesn't do. The PS1 version has better music though. Isn't that what I mentioned with PGXP?